Australians will have a new one-stop option to the east coast of the United States from October when Singapore Airlines starts operating the world’s longest nonstop passenger flight between Singapore and New York. The Singapore-New York (Newark) service is due to start on October 11 with Airbus A350-900ULR (Ultra Long Range) equipment, SIA said on Wednesday. Initially there will be three flights a week on the route, increasing to daily from October 18. The aircraft, which commenced flight testing in April, will be configured with just 161 seats comprising 67 in business class and 94 in premium economy class. SIA said it would take delivery of the first A350-900ULR in September, with all seven of the type on order due to arrive in the fleet by the end of 2018. Flight schedules show SQ22 departing Singapore at 2335, arriving at Newark Liberty International Airport (located in New Jersey) at 0600 the next day. The reciprocal SQ21 is due to take off from Newark at 1045 and touch down in Singapore at 1730 the following day. There will be some slight alterations to account for daylight savings in the United States. 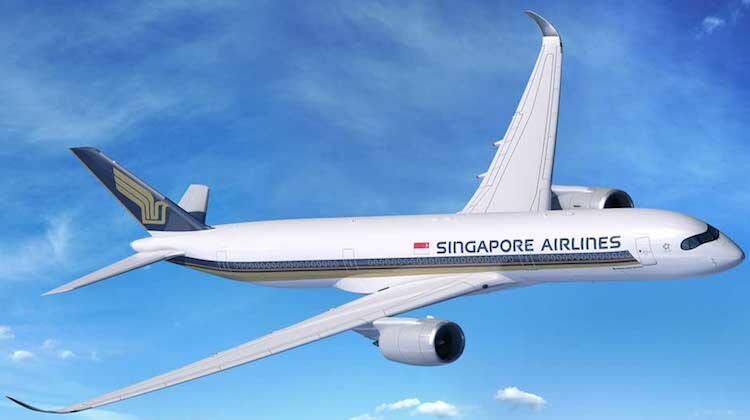 The resumption of SIA’s Singapore-New York nonstop flights five years after they were suspended due to high oil prices will give Australians an alternative routing to New York that does not include domestic to international connections either in Australia and/or the United States. As an example, Singapore Airlines regional vice president for South West Pacific Phillip Goh talked up the convenience for travellers headed to New York from Perth. “From October our West Australian customers will be able to access one of the fastest one-stop options from the West Coast of Australia to the East Coast of America,” Goh said. The airline is the only customer for the ultra long-range variant. The A350 program, which comprises the -900, -900ULR and -1000, has secured 832 firm orders from 45 customers as at April 30 2018, figures from Airbus show. 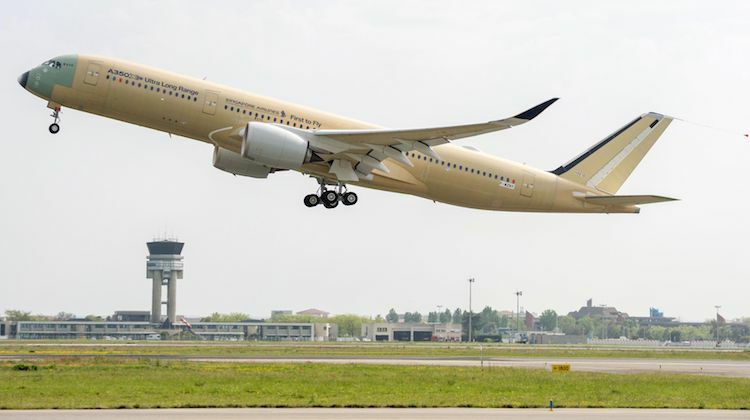 “Singapore Airlines has always taken pride in pushing the boundaries to provide the best possible travel convenience for our customers, and we are pleased to be leading the way with these new non-stop flights using the latest-technology, ultra-long-range Airbus A350-900ULR,” SIA chief executive Goh Choon Phong said. SIA also planned to reintroduce Singapore-Los Angeles flights in 2019. Currently, the airline’s United States network comprises a nonstop Singapore-San Francisco flight, as well as Singapore-Hong Kong-San Francisco, Singapore-Tokyo Narita-Los Angeles, Singapore-Seoul Incheon-Los Angeles, Singapore-Manchester-Houston and Singapore-Frankfurt-New York JFK. The A350-900ULR is also a contender for Qantas’s demanding Project Sunrise requirement for an aircraft capable of operating nonstop flights from Sydney to London and New York by 2022. The aircraft features a modified fuel system, which increases the fuel carrying capacity by 24,000 litres (from 141,000 litres to 165,000 litres) over the standard A350-900 without the need for additional fuel tanks. This is achieved through modifications to the layout of the piping and valves within the fuel tank. There is also a performance improvement package with larger winglets, a slight twist to the wing compared with the standard A350-900, as well as changes to the flap fairing and belly fairing. 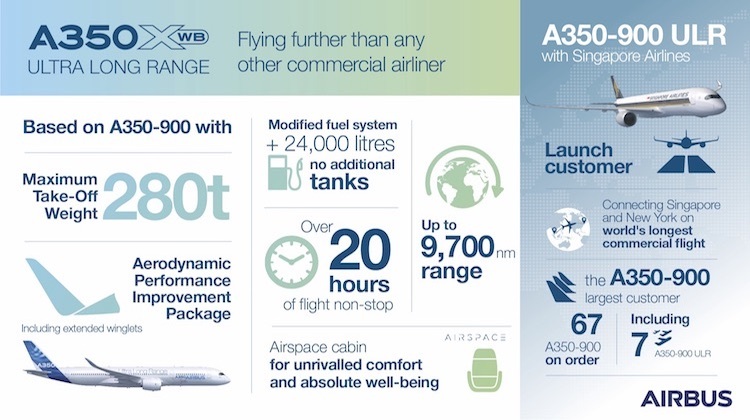 The A350-900ULR has a maximum takeoff weight of 280 tonnes also has to be certified. Singapore-New York Newark (8,285nm) would be the world’s longest nonstop passenger flight. Currently, Qatar Airways’ Auckland-Doha nonstop flight tops the list at 7,848nm, ahead of Qantas’s Perth-London Heathrow service (7,829nm).